These Budget Priced Aluminum Hose ends are constructed from lightweight 6061 alloy aluminum, and are compatible with all AN style adapter. These Budget Priced Aluminum Hose ends are constructed from lightweight 6061 alloy aluminum, and are compatible with all AN style adapter fittings. Chrome Plated Dual feed line kit for Holley Carburetors. CNC Machined to exact tolerances, Increase horsepower and RPM.. Different heights adjust the plenum area to add RPM and torque for more upper range performance!!! Adds 10 - 25 Horsepower and consistent E.T. 3-D, 4Hole contoured design features a flow enhancer cavity that increases flow under the carb, Isolates heat from intake to carb. Withstands temps up to 400 degrees. Fits Holley 4150/4160 carbs and Carter bolt pattern. Comes complete with studs, nuts, washers and gaskets. 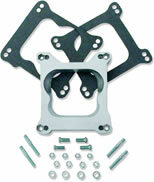 Adapts Holley or AFB 4bbl carb to Quadrajet manifold or flips over to adapt Quadrajet carb to Holley or AFB 4bbl manifold. Die-Cast aluminum 1" adapter. Includes all gaskets and hardware. Fits all Holley carbs where fuel enrichment from the power valve is not desired in Race Applications. High compression nylon fuel bowl washers are unaffected by fuel and alcohol. Will not tear or deteriorate like standard fiber washers. 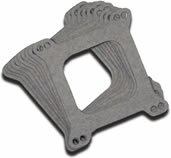 Rubber replacement accelerator diaphragms. For gasoline use only! CNC Machined from aircraft quality 6061 t-6 billet aluminum. Furnished with an adjustable carburetor throttle cable end that is specifically machined to fit Morse/Teleflex cables. Made from lightweight billet aluminum and are precision fit to your carburetor for precise activation of the micro switch. Fits Holley H.P. and Non H.P. Holleys. Includes mounting hardware. Available for 4150/4160 and 4500 series carburetors. 2-5/8" dia full sweep dial with black face. 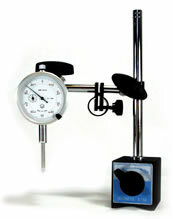 Gauge kit includes adapters, tubing kit, light kit, mounting hardware and instructions. Replacement Nylon line kit for oil pressure gauges. Includes 72" 1/8" nylon line and fittings. 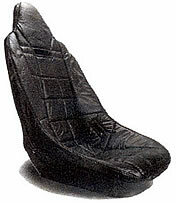 Easy fore and aft adjustment of racing seats, Double locking rails. 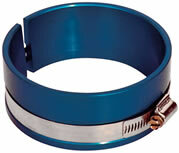 One quart capacity, -6AN inlet fitting, Reusable clamp-on breather, 2 molded in mounting inserts. Reduces pressure build up in your engines crank case. This kit mounts a new starter solenoid in a cooler spot away from Hot Exhaust heat!! Kit includes a Ford style remote starter solenoid, terminal ends, and all necessary wiring and installation instructions. Provides protection of a relay for continuous voltage supply. Kit includes a 40 amp relay, circuit breaker, 48" long wire harness, assorted terminal connectors and installation instructions. The unique design of the weather pac connector provides reliable connections that are not affected by water, oil, gasoline, dirt, vibration or temperature. Connector locks together and provides each terminal with its own barrel, which leaves no chance of shorting. Each terminal has silicone seals with multiple sealing ribs to prevent contaminants from entering through the wire or nylon housing. Push button momentary switch with coiled cord. This Economy diverter control button has an 18" straight cord wiring harness insead of the fancy curly telephone cord. Includes diodes. One turn of the knob disconnects the battery connection, rated @ 100 amps, for 12 or 24 volt systems. Rated @ 175 amps continuous : 1,000 amps intermittent. Clips on the alternator terminal just like the stock one did and won't vibrate off. Works with GM 10si and 12si series alternators. Factory replacement HEI Pigtail harness. Hilborn style with inlet screen and bezel, Polished aluminum with fins, Adjustable centerline on dual quad version, Fits 5-1/8" carburetor necks. Give your Boat the Nostalgic look of the 70s with these Polished Aluminum valve covers they come with breather holes and internal baffles. """ Available for SBC 58-86 / SBC 87-up center bolt / BBC 65-95 / SBF 289,302,351W. Chrome plated steel top, High flow open element design. Billet aluminum breather clamp mounts on valve cover with a lock nut and O-ring seal, Uses standard 1-1/4" push in breathers. Valve Cover Gaskets Slicone rubber with steel core gives added support and prevents gasket slippage and movement, Hi-tech material is ideal for high crankcase vacuum conditions using a vacuum pump. Made of durable braided stainless steel, with aluminum fittings and dipstick handle. Reduces heat radiated off headers by up to 50%, Increases H.P. by keeping heat inside header pipes. 2" wide 50' roll. Use 2 to 2-1/2 rolls aprox per header. Its best to soak header rap in water before rapping header for that "TIGHT Rapped Look" Than after start up, Spray header rap with High Temp Paint inorder to seal the rap fibers. Self-adhesive aluminized fiberglass thermal tape, Protects upt to 2000' F Radiant heat, Easy to apply and is extremely flexible, 1-3/8" wide 15'foot long roll. Protects spark plug boots from Extreme header heat. Protects up to 1200'F, Simply slides over spark plug boot. Gaskets are made of .043" dead soft copper material, annealed for strength, Embossed O-Ring design for tight leak proof seal, Will NOT shrink, deteriorate or blow out even in severe duty applications. Heavy Duty polyethylene construction, 5 gallon capacity. Replacement cap for EZ 2-handle fuel jugs. 18" long with a built in anti-splash ring at top, Spout can be cut to desired length and diameter. Filter Screen designed for use with D-Shaped Funnel. Reduces the Harmful noise we subject our ears to, while tuning on open header boats! Made of Aluminum with a hard anodized coating and tapered inner diameter compresses the piston rings for smooth installation. A Must Have for initial start up on Fresh engines! Or you could always cut the top off an old distributor and use that!! ? Fits both Big Block Chevy and Small Block Chevy. In order to properly pre-load a rod bolt it must be installed by stretching it to its Manufactures Yield, Just Torquing a rod bolt simply doesn't cut it on High Horsepower applications. Fits rod bolt up to 2.750" long. High Quality jeweled movement .001" increment reading with revolution counter. 2-1/4" Dia face. High Quality jeweled movement .001" increment reading with revolution counter. 2-1/4" Dia face. 0 - 1.0" travel. Includes mag base, 100lb magnetic pull base, with turn knob release. 100s of uses, Check piston height, Degree cams, Check run-out or end play on cranks. Kit contains: Print dyed nylon 12" X 18" U.S. 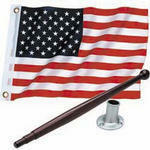 Flag, Chromed brass pole socket & Varnished mahogany 8" flag pole. Universal application Marine Speedometer Pitot, 80 MPH Maximum, Weed-resistant system provides steady water pressure required for accurate readings. Kick-up feature prevents breakage.